Although you may have known or even have tasted lots of Thai Food, consult this checklist and see whether you have passed these following 10 things or not. Don't miss any of them! Emerald Buddha Temple and the Grand Palace are the signature landmarks of Bangkok. Emerald Buddha is believed to be the most holy and most important Buddha statue among all others since the beginning of establishing Bangkok as the capital city of Thailand (over 200 years ago). Visiting the temple is believed to be ultimate blessing for Thais and foreigners. Please be informed that you are required to dress properly to enter the temple; no shorts, short skirt, sleeveless shirt, or any revealing outfit. From here, you may walk around 200 meters or take taxi to Tha Pra Chan to find nice Thai Street Foods. Both locations are best known for night life but they are slightly different. Silom Road contains more night clubs and bars, while Khaosan Road is more like a night market with bars. Khaosan Road is perfect for a stroll through the nightlife, night market and Thai street food vendors. 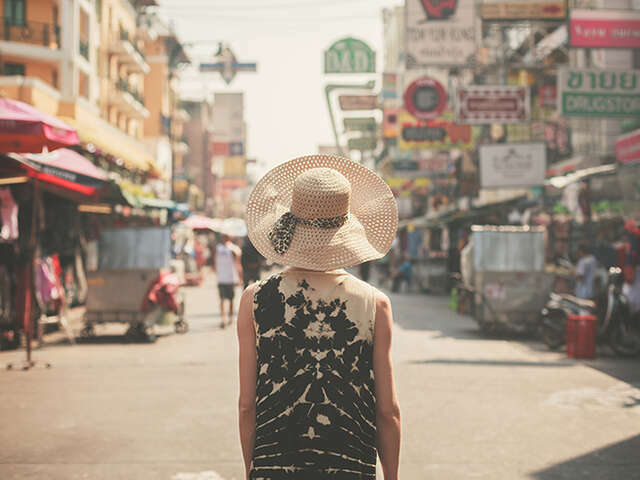 Enjoy yourself and feast your eyes by visiting Chatuchak Weekend Market, the biggest open-air market in Thailand and the most well-known shopping place of Bangkok to both locals and foreigners. You will find thousands of shops and vendors selling everything imaginable from handicrafts, wood sculptures, paintings, silver ornaments, furniture, clothing, books, plants, pets and Thai food and drinks. Browsing through all sorts here will take you an entire day! Durian and mango are the real pride of Thai fruits. Many foreigners give up on rying durian because of its acute smell. Be brave and have a bite - you will find a harmonious blend between sweet flavour and creamy texture lying beyond the intrusive smell. Mango, in contrast, has a pleasant sweet and refreshing scent and is undeniably easier to eat than durian. Both fruits get along perfectly with Khao Nieow Moon (sweet sticky rice).